We got going at our usual 5:30am Sierra time. Within an hour, we were over Mather Pass. I was definitely not a fan. The other passes had a clear path in the snow that we were able to follow. This pass had footprints going in all directions so it was kinda like choose your own adventure each time the footprints split. Toward the end, I was wishing we had chosen the other option. There was some real sketchy rock scrambling involved in our route including a few steps across a ledge that was way too narrow with nothing to hold on to. 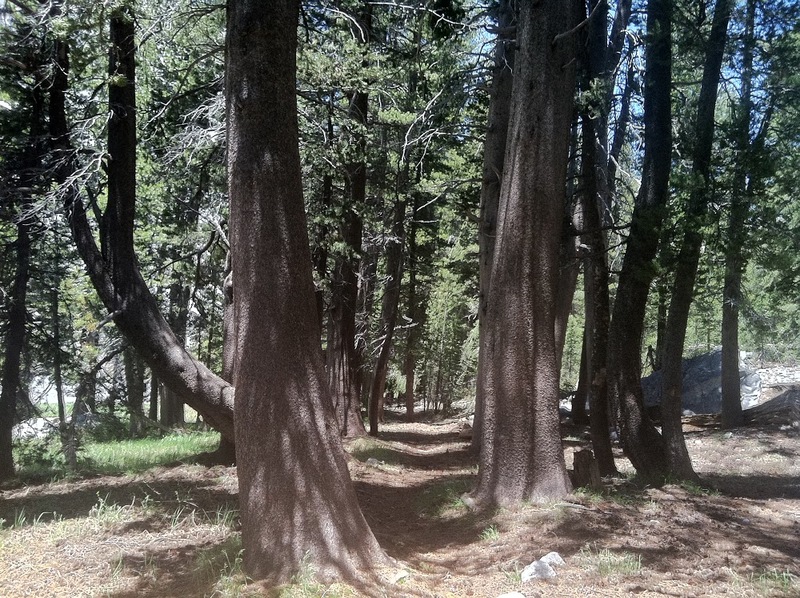 I was a mess and my legs were shaking and Pine stood there to reassure me…but I hated it! Then it was the moment we all were dreaming of last night. We got to descend 3,800ft to a low enough elevation to where there was no snow! With that in mind, I made and effort to really enjoy the “dry” trail while we have it. I say “dry” because it was covered in water. Not just a little either. We spent a lot of time walking on the trail in water that was ankle to knee deep and it was actually nice because it was hot outside. I’ve just never seen anything like it for such a long period of time. 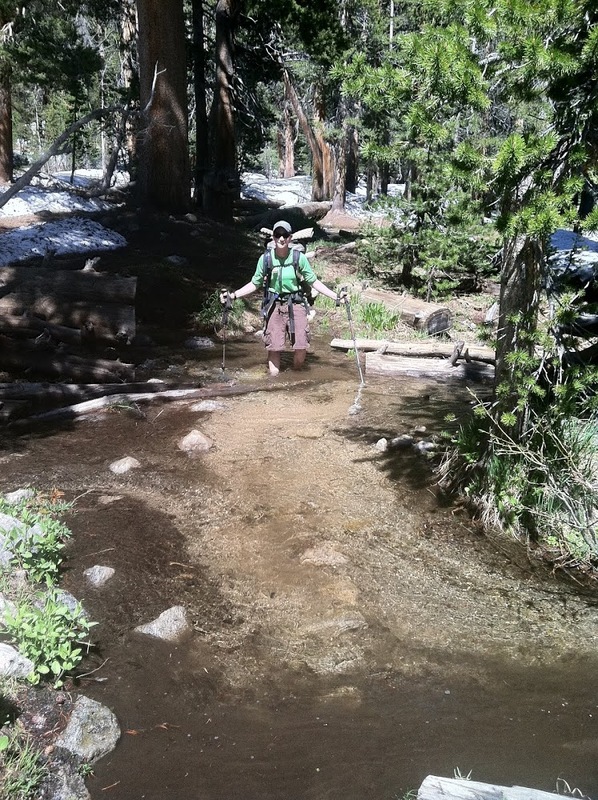 The groove of the trail makes for a perfect place for all that water running down from the mountains. We were very excited to do 17.5mi before 4pm. That’s amazing out here! We are about 5mi from Muir Pass and decided to camp early instead of heading too high and back into the snow. Also, we can have a campfire because we are below 10,000ft. 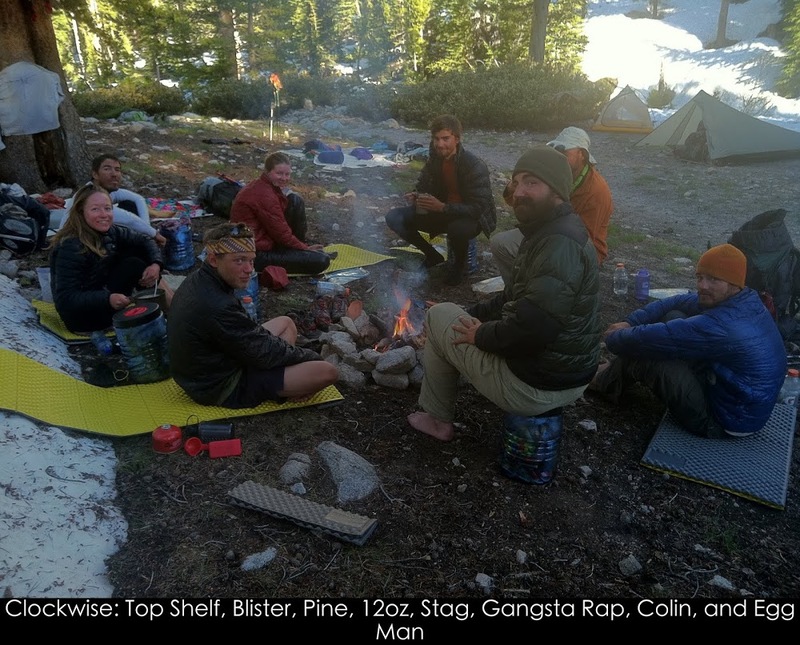 The guys love that and it also encouraged Egg Man and Team Legs to camp with us. Here is everyone having dinner around the fire. Tomorrow, we’ll be in snow most of the day, so I’m taking it in while I can. As a side note, my ankle is just giving out too often. It is causing me to hike very hesitantly because I’m worried that it will roll every step. I have taped it and I hope that will give it more stability until we’re done with the snow.